So it turns out I may have jumped the gun a bit on my last post. About a minute after hitting publish, I realized that I had forgotten a few recent news items, including, oh, I don’t know, a fundraiser that I helped organize for the last six months. My 31-year old mind is not what it used to be. But I can still name the 50 states and all the presidents, so at least I’ve got that going for me. Since this is my own site and I answer only to myself, I can undo my omissions with a simple follow-up post. Approximate reaction after hitting publish. First and foremost on my list of forgotten updates – the rousing success of the 4th annual Strength, Science and Stories of Inspiration fundraiser! For those of you who are not familiar with the event, SSSI (as we call it for short) is a fundraiser that aims to bring together stakeholders in the Boston-area muscle disease community for a night of entertainment, storytelling and networking. 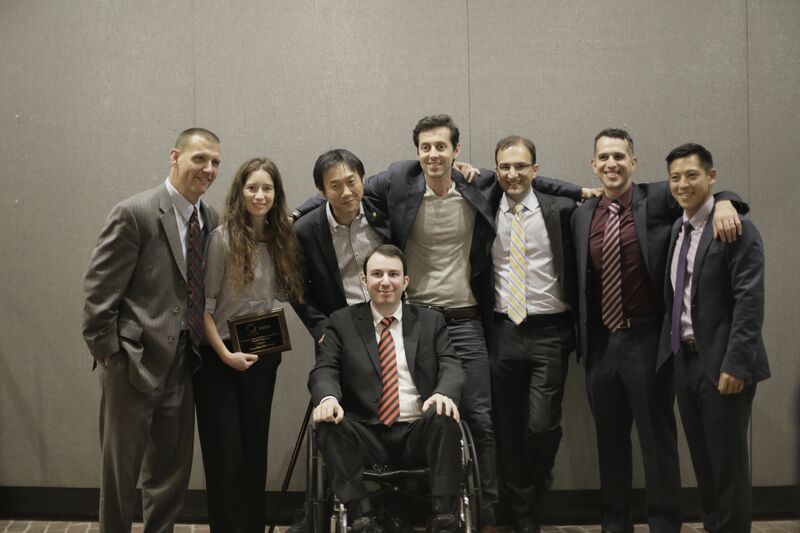 It was started in 2013 by my co-organizers, Sharif Tabebordbar, Albert Almada and Eric Wang, muscle disease researchers who each have a family member with muscular dystrophy. This year’s event was the third SSSI I have had the privilege of helping to co-organize, and it was our biggest crowd yet – close to 600 attendees! The night was chock-full of laughter and emotion, and built on (or is it upon? I can never figure it out) the success of our previous events. 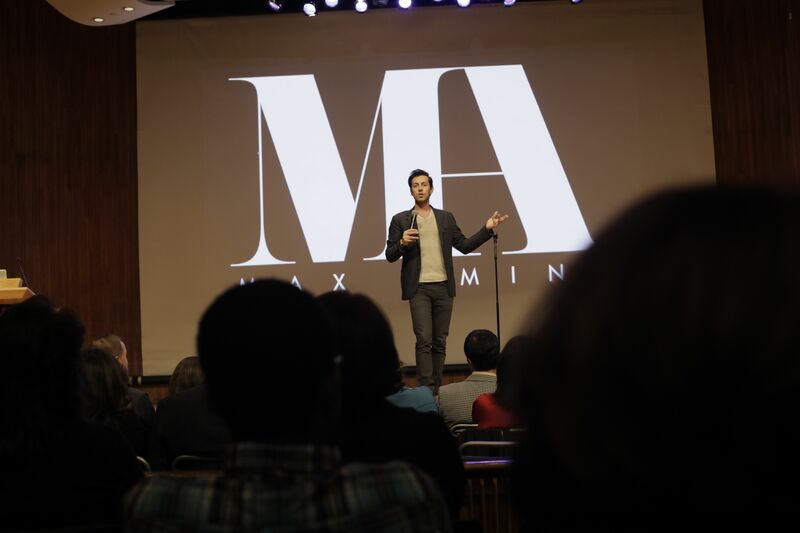 We had two great patient speakers, Rob Besecker and Monkol Lek, and for the second year in a row our headliner was talented comedian, friend, and ALS family member Max Amini. In addition to our entertainment, we also awarded our very first research fellowship to Maya Maor Nof, a talented postdoctoral researcher at Stanford University. This fellowship has been a dream of ours for several years, so to see it come to fruition was both exciting and emotional. Overall, it was an exhilarating night, one that I recapped in an article for the Muscular Dystrophy Association (MDA) a couple weeks back. Thanks to Max’s photographer for this great picture. From left to right: Rob, Maya, Monkol, me, Max, Sharif, Albert and Eric. My second update pertains to another MDA article. 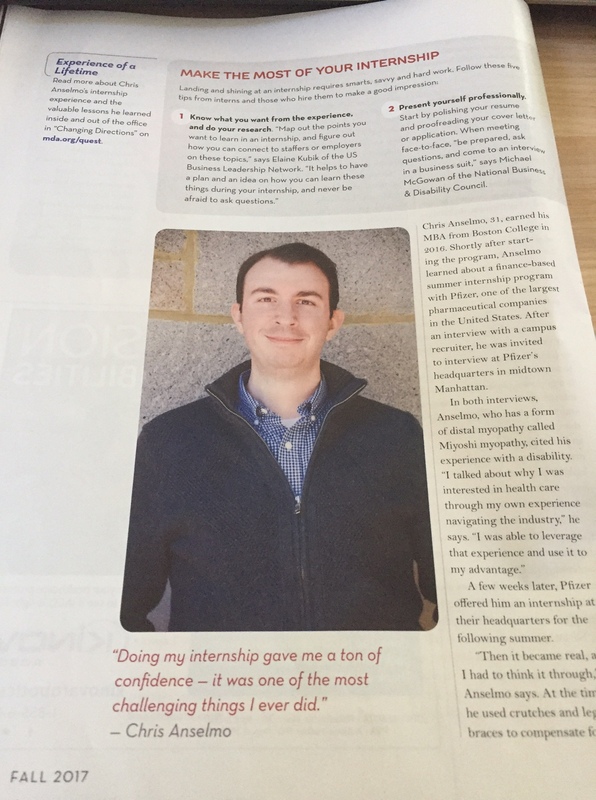 I was recently interviewed in MDA’s quarterly magazine, Quest, about searching for a summer internship while living with a disability. It’s a topic that I know very well, having dealt with it two years ago. I’ve talked to other patients with MD who have wondered if they could realistically go back to school. I wanted to share my story about my journey so that I could help others believe in themselves that yes, it is possible. School, internship, all of it. It will require some extra planning, and it won’t be smooth sailing, but it can absolutely be done. In my internship experience, I relocated from Boston to New York City for a summer. Part of the reason I try to push myself is so that later on, I can use the knowledge gained to empower others to do the same thing. So many others have helped me in the same way. Photo courtesy: me. Photo courtesy on the page itself: Jennie Kang. And for my last update – also involving MDA (as you probably can tell by now advocacy is a major part of my life) – I was a last-minute keynote speaker on October 7th! It was a financial summit sponsored by MDA which took place at the Marriott hotel in Quincy, Massachusetts. The aim of the event was to provide financial advice and planning for MDA families, as this disease can be a burden on a family’s finances. Originally, the MDA national goodwill ambassador, Joe Akmakjian, was supposed to be the keynote, however he got sick and was unable to attend. I was asked Thursday afternoon, and a day and a half later, I found myself in front of a room full of MDA families. It was a whirlwind day to say the least. Overall, it was an interesting experience – I was told I could just talk about my patient story, but it was a financial summit, so I knew I had to twist my usual story a little bit and talk finances, and how I was able to budget out for things like adaptive equipment and business school. Although it was last-minute, I was glad to impart some financial wisdom on the crowd, and I know my dad was proud, since after all, he was the one who imparted the wisdom on me in the first place. Without my dad, I don’t know if I would have had the same financial discipline. Well, maybe I would have, but it would have taken much longer to learn. When I got home Saturday night, I was whipped. The fatigue lasted a couple days, into Tuesday. It was only a week after the Strength Science fundraiser, which also left me tired for a few days. Believe it or not, it can be tiring sitting in a wheelchair all day! All in all though, it’s been an eventful few months, fatigue aside. As long as I’m able to do all this (without impacting my day job of course), as long as my parents are willing to be my chauffeurs and caregivers, I will continue to stay active in the muscle disease community – writing, speaking, whatever it takes. I don’t do well sitting still. I think you can tell by now.